Most users who want to see weather reports on their operating system use gadgets to do so. Windows 7 ships with a weather gadget that can display the weather conditions in a specific place or location. Gadgets on the other hand have the disadvantage that windows can block their view. If you want to look at the weather report, you therefor may have to minimize all windows, or use a shortcut, to do so. WeatherBar for Windows 7 offers an alternative way of displaying weather information on the operating system. The weather software displays relevant information directly in the Windows 7 taskbar, so that it is not longer necessary to minimize windows to see the current weather report. When you start the portable software for the first time, you will need to change the default location. This is done with a click on the edit icon in the main program interface. Just enter your city and country, the program should pick the right location based on the data. The main program window displays the current weather conditions and the weather forecast for the next three days. Besides that you get information about the current humidity and wind speed and direction. Users can switch to the metric data format in the program options. The program indicates the current weather conditions in the Windows taskbar when minimized. The icon indicates the current condition, the color the humidity levels. 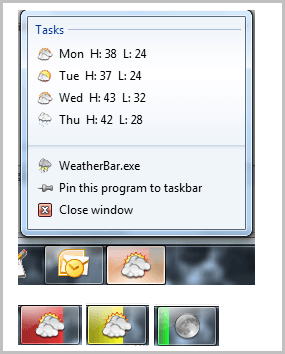 A right-click on the program icon displays the application's jumplist that lists the current weather conditions and forecast as tasks in the window. WeatherBar is a handy, lightweight weather reporting software for the Windows 7 operating system. No information are provided if the program is compatible with previous versions of windows. The program would however lose much of its functionality if it is compatible under those versions of Windows as well. Windows users can download WeatherBar from the project website over at Codeplex. Looks like a handy tool, I’ll give it a go. By the way, you don’t need to minimize all windows to see desktop gadgets. Pressing Win+G will bring them to the front. Sadly, pressing it again doesn’t toggle them into the background again but clicking the window that covered them will.